Sting Will (Gently) Rock the Met in Honor of Hudson River School Great Thomas Cole - The British musician's performance will be a blend of song and storytelling. Be still my beating heart. Hudson River School painter Thomas Cole and English rock star Sting may seem like an unlikely pairing, but it’s a match made in heaven - or so says New York’s Metropolitan Museum of Art, which has announced a three-night concert series with the former Police frontman as part of the programming for the exhibition “Thomas Cole’s Journey: Atlantic Crossings” (January 30–May 12). Sting, who co-founded the Police in 1977, has sold over 100 million records, won 16 Grammy Awards, and been honored with a star on the Hollywood Walk of Fame. Cole, who founded the Hudson River School, an American art movement dedicated to immortalizing the natural beauty of Upstate New York, has work in the collections of major museums around the world and an auction record of nearly $1.5 million, according to the artnet Price Database. But are the two men more than just shadows in the rain? What do they really have in common? Just as Cole’s lush landscapes responded to the natural beauty of his home in Catskill, New York, and the surrounding Hudson Valley, “Sting has often mined his childhood memories of Northern England for creative inspiration,” the Met writes in the event description. “Both artists saw their respective landscapes destroyed by modern intrusions - one by the collapse of England’s shipping industry, the other by incursions of the Industrial Revolution into the American wilderness.” Landscape, loss, modern-day malaise - these are the soul cages. The performance, which includes both song and storytelling, will also feature a visual component. Sting will take the stage in front of artist Stephen Hannock’s “visual scenescape.” The two are friends and their collaborative art book, The Last Ship from the River of the Northern City with Lyrics by Sting and Prints by Stephen Hannock (2017), will be on view in the Met’s American Wing during the Cole show, along with a 2000 painting by Hannock inspired by Hudson River School painters. Tickets for the April 25 and 26 shows are $125–175, with a special members-only performance on April 24. Attendees will have the chance to view the show after hours, free of crowds, before settling into their seats. So rev up the windmills of your mind and bring on the night! Tickets on sale now from The Met. Met Museum to Explore Transatlantic Career of Renowned Painter Thomas Cole Exhibition Marks 200th Anniversary of the Artist’s Arrival in America. Celebrated as one of America’s preeminent landscape painters, Thomas Cole (1801–1848) was born in northern England at the start of the Industrial Revolution, emigrated to the United States in his youth, and traveled extensively throughout England and Italy as a young artist. He returned to America to create some of his most ambitious works and inspire a new generation of American artists, launching a national school of landscape art. 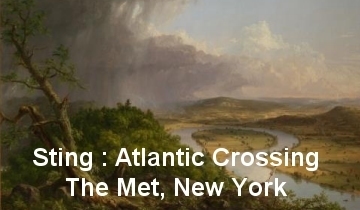 Opening January 30 at The Metropolitan Museum of Art, the exhibition Thomas Cole’s Journey: Atlantic Crossings will examine, for the first time, the artist’s transatlantic career and engagement with European art. With Cole’s masterwork The Oxbow (1836) as its centerpiece, the exhibition will feature more than three dozen examples of his large-scale landscape paintings, oil studies, and works on paper. Consummate paintings by Cole will be juxtaposed with works by European masters including J. M. W. Turner and John Constable, among others, highlighting the dialogue between American and European artists and establishing Cole as a major figure in 19thcentury landscape art within a global context. The exhibition marks the 200th anniversary of Cole’s arrival in America. The exhibition is made possible by The Peter Jay Sharp Foundation. Additional support is provided by the Henry Luce Foundation, White & Case LLP, the Enterprise Holdings Endowment, and the Terra Foundation for American Art. It is organized by The Metropolitan Museum of Art, New York, and The National Gallery, London. The exhibition follows the chronology of Cole’s life, beginning with his origins in recently industrialized northern England, his arrival in the United States in 1818, and his embrace of the American wilderness as a novel subject for landscape art of the New World. Early works by Cole will reveal his prodigious talent. After establishing himself as the premier landscape painter of the young United States, he traveled back to Europe. The next section will explore in depth Cole’s return to England in 1829–31 and his travels in Italy in 1831–32, revealing the development of his artistic processes. He embraced the onsite landscape oil study and adopted elements of the European landscape tradition reaching back to Claude Lorrain. He learned from contemporary painters in England, including Turner, Constable, and John Martin, and furthered his studies in landscape and figure painting in Italy. By exploring this formative period in Cole’s life, the exhibition will offer a significant revision of existing accounts of his work, which have, until now, emphasized the American aspects of his formation and identity. The exhibition will also provide new interpretations of Cole’s work within the expanded contexts of the history of the British Empire, the rise of the United States, the Industrial Revolution and the American wilderness, and Romantic theories of history. Upon his return to America, Cole applied the lessons he had learned abroad to create the five-part series The Course of Empire (1834–36). These works reveal a definition of the new American Sublime that comes to its fullest expression in The Oxbow (1836). Finally, the exhibition concludes with an examination of Cole’s legacy in the works of the next generation of American landscape painters whom Cole personally mentored, notably Asher B. Durand and Frederic E. Church. The exhibition was organized by Elizabeth Kornhauser, the Alice Pratt Brown Curator of American Painting and Sculpture at The Met, and Tim Barringer, Paul Mellon Professor of the History of Art at Yale University, with Chris Riopelle, Curator of Post-1800 Paintings at the National Gallery, London. Exhibition design is by Brian Butterfield, Senior Exhibition Designer; graphics are by Ria Roberts, Graphic Designer; and lighting is by Clint Ross Coller and Richard Lichte, Lighting Design Managers, all of The Met Design Department. The exhibition will be accompanied by a catalogue suitable for both scholars and the general public. With new information on Cole’s life and revisionist interpretations of his major work, the publication will also feature research by The Met’s conservation team into Cole’s methods as a painter, illuminating this previously neglected area. The catalogue will be available for purchase in The Met Store (hardcover, $65). The catalogue is made possible by the William Cullen Bryant Fellows of The Metropolitan Museum of Art. A series of Education programs will complement the exhibition. MetLiveArts will feature a 40-minute acoustic performance by Sting in the Museum’s Grace Rainey Rogers Auditorium on April 24, 25, and 26 (7:30 p.m.). Prior to each concert, ticket holders will enjoy a special viewing of the exhibition with curators Elizabeth Kornhauser and Tim Barringer. The April 24 performance of “Sting: Atlantic Crossings” is for Members only. Tickets will be available for purchase in early 2018. On April 8 (2 p.m.), as part of MetSpeaks, American artist Ed Ruscha will discuss his seminal five-part Course of Empire series (1992 and 2003–5) with his friend, the author and artist Tom McCarthy, who resides in London. Tickets for this event will be available for purchase. Met curator Elizabeth Kornhauser and paintings conservator Dorothy Mahon will explore Cole’s work methods and techniques with artist Stephen Hannock on February 7 (6:00 p.m.), revealing the layers of meaning in Cole’s iconic painting, The Oxbow. This program is part of the Conversations With… series. Elizabeth Kornhauser will moderate a Sunday at The Met discussion on April 15 (2 p.m.) on Cole’s role as a proto-environmental artist with scholars Alan Braddock and Rebecca Bedell and artist Michel Auder. (Auder’s 2017 work The Course of Empire was shown at the Documenta exhibition in Kassel, Germany.) These programs are free with Museum admission. In a Gallery Performance on April 27 (6:00 p.m.), exhibition co-curator Tim Barringer will explore the musical and literary references that inspired Cole. This program is free with Museum admission, advance registration is required. Education programs are made possible in part by the Clara Lloyd-Smith Weber Fund and The Mr. and Mrs. Raymond J. Horowitz Foundation for the Arts. After the presentation at The Met, the exhibition will be shown at The National Gallery, London (June 11–October 7, 2018).